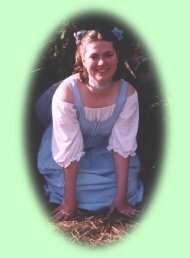 Well, as you probably saw on the main page, my name is Rachael Haring, and I'm an author of fantasy and science fiction. I live in Monmouth County, New Jersey with my hubby. Before that, I lived in Berks County, Pennsylvania, for most of my life, except for short stints studying in Shippensburg, PA and Aarhus, Denmark. I'm relatively short, frequently cheerful, and inordinately fond of any kind of Asian food. I drive a yellow Volkswagen Beetle who goes by the name of Sunny. I'm the co-owner of Glass Slipper Weddings and Events, LLC, a comprehensive wedding and party planning company. In my free time, I enjoy writing (obviously), reading fantasy and humor, watching movies, playing video video games, Web surfing, spending time with my hubby, listening to my large collection of trance, synthpop, and new age CDs, and generally making a big nerd of myself. I love to sing, and I was previously a member of the Bach Choir of Bethlehem, the oldest such choir in the U.S. I'm a big fan of sewing, cooking, and crafting. Currently, I take Middle-Eastern dance lessons with the lovely and wonderful Gia al Qamar. I'm also a member of her troupe, the Urban Desert Dancers. To see my professional resume, click here. A very good question that I would congratulate you on, were I not the one who posted it in the first place in a transparent attempt to ramble on about myself. I've always loved writing, and I've always loved imaginative fantasy, so I suppose that it's no great surprise that I've put them both together as my number one hobby (and one day, I hope, career). I adore fantasy writing for several reasons, not the least of which is the chance to create an entire world from scraps of my own experiences. I can take images and hints of my own life, twist them into fantastic situations, and write about them within a new light. I can make new races complete with odd physiologies and mental quirks and then outfit them with very human, intensely sympathetic personalities. I've often found beauty in the slightly off-kilter, and within my fantasy worlds, I can literally bring that odd aesthetic to life. I can describe and devise magical systems, thereby giving my characters both incredible power and poignant burdens. I try to make characters who are at once familiar and improbable, and I love to face them against villains as undeniably human as they are misguided and/or selfish. Fantasy is also cathartic. I've worked through many an emotion or situation simply by letting my characters face similar circumstances. On the other side, I've sent my characters on wonderful, beautiful journeys that I only wish that I could take. I'm cruel and generous to them by turns, and sometimes it even surprises me how they react to what I throw at them. As crazy as it sounds, I'm often tempted to believe that they are actually flesh and blood people merely separated from me by some interdimensional wall. It's immensely satisfying to see their struggles come to conclusion. To me, fantasy is also a very visual, tactile, nearly cinematic genre. Good fantasy, I feel, is a fully sensory experience. In my own fantasy, I try to recreate this full-body feeling. I want my readers to smell the earth beneath my characters' feet, feel the breezes drifting through the villages, and see the morning sunlight. I want to tell more than a simple story. I want to show a reality. If you want to contact me, and I know you do, just go here to find out how!